Austin Beutner has lied in the district media statement today and continues to disrespect students and educators. UTLA will not abandon students and be bought off by salary when Beutner attempts to raise class sizes and ignores making other basic improvements for students. LAUSD writes today that in yesterday’s letter, the district offered to “set firm boundaries to safeguard against increasing class sizes.” In fact, the district offer raises class sizes and provides clear pathways to raise them even more — in a district and state with some of the highest class sizes in the country. Yesterday’s offer states that class sizes would go from those in the current contract to those in an August 22, 2017 MOU. Those in the MOU are across-the-board higher than those in the contract — up to 7 students per class higher. This is shocking. Moreover, the district offer deceptively states that it will delete Section 1.5 of the class-size article of the contract. This is the section that allows for the district to unilaterally increase class sizes whenever it wants — and it is the section that forced the higher class sizes in the 2017 MOU. Yet, in a deceptive sleight of hand, the district offer replaces Section 1.5 with a list of 9 circumstances under which LAUSD could increase class sizes even more — circumstances that are virtually certain to occur, particularly with privatizers like Beutner at the helm of the district, intent on downsizing the very district they preside over. Beutner has replaced Section 1.5 with Section 1.5 on steroids. Certainly this pleases his billionaire charter school benefactors, for whom LAUSD class-size reduction is an existential threat. LAUSD class-size reduction would allow district schools to compete with charters for enrollment, would take co-located classrooms away from charters as more classrooms are needed in district schools, and would draw charter teachers away as the district needs more teachers. 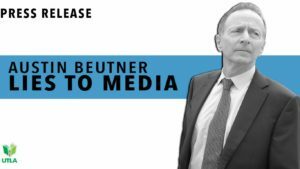 Moreover, Beutner states today in his release that the district has offered a “6% salary increase with no contingency.” This is also a lie, as the offer is connected to concessions on healthcare and additional work. Most stunning, the district claims in its statement that it is operating in good faith. Yet, Beutner continues to center his proposals on salary only, undermines class size, and does not respond at all to the majority of UTLA’s proposals — proposals on more nurses, more counselors, more arts and music, less testing, more decision making for educators and parents on school budgets, improvements to early education, regulation of charters, and more. The district’s offer is insulting, and its lies are reprehensible.